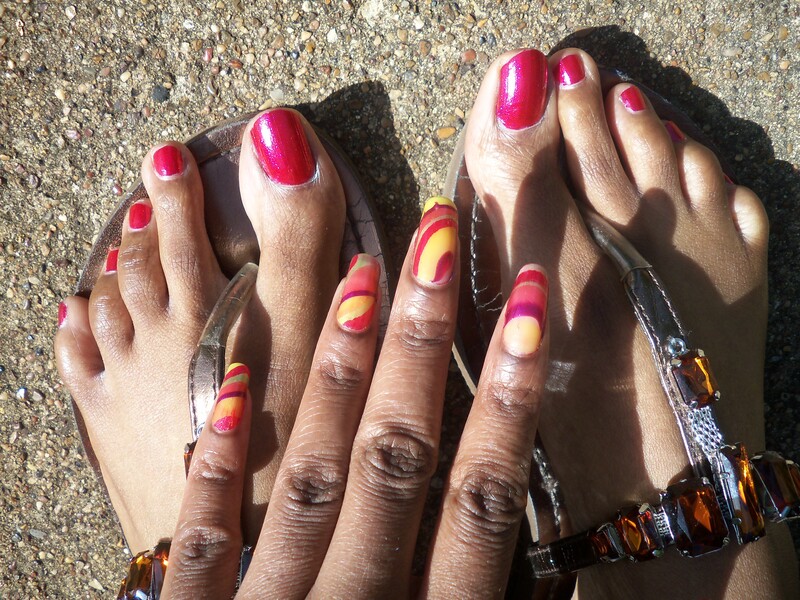 Does Your Fingernail Polish Always Match Your Toenail Polish? Yes I Have Long Toes! Years ago, I was talking to my aunt, and we were having a conversation about this lady. I don’t remember much, but I remember at the end of the conversation my aunt, in an almost disgusted manner, described how tacky it was that the lady’s fingernail polish didn’t match her toenail polish. Like it was the ultimate sign of her true character. I’ve always kept that in mind, cause I didn’t want folks to think that I was tacky for not matching my polishes. So for a while I was very strict about it. If I couldn’t redo both my fingernails and toenails, then I wouldn’t have any polish on them at all. Now it’s more like if I’m tired and/or lazy, I won’t redo my toenails and just go around mismatched. Doing my fingernails is fun, my toenails not so much.